I think this is almost unprecedented in Magic history: a potentially one-mana counterspell. It’s basically this and Stubborn Denial from Tarkir, and that older spell is only noncreatures. Admiral’s Order has a surprising amount of versatility – remember that its raid cost is already “active” during combat, so you can effortlessly stop cards like Settle the Wreckage, Sandblast, or Retaliate. On top of this, you should basically always win any counterspell wars that take place in your second main phase. 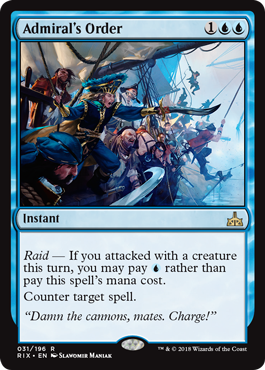 For this reason, I wouldn’t be surprised to see Admiral’s Order get a run in larger formats, where there are, if anything, even more creature decks with counterspells (Faeries, Merfolk, Agents of S.N.E.A.K. Structure and Force in silver-bordered Legacy . . .). “Cancel with upside” seems to be a recurring trope, but Admiral’s Order is quite a nice upside indeed. If you successfully declare an attack, you get a counterspell better than even Counterspell until the end of your turn, which is an excellent way to make Main Phase 2 or combat go the way you’re hoping. Cancel’s often been at least playable enough in Standard, but this definitely usurps it in many cases, since it’s no worse than its less flashy counterpart. If you’re in an aggressive blue (or part-blue) deck, this is definitely worth a look.